With the adoption of cloud going main stream, huge amounts of sensitive data is being moved from in premise infrastructures to the cloud platform, to help reduce costs of hardware, maintenance and achieve more reliability. While it is a fact that by virtue of leveraging a well designed cloud platform like AWS (Amazon is known for its reliability of its resources with almost no downtime of the data centers), your applications benefit from increased reliability and up-time, our engineers however learned that it is not enough if we want to move up that last 0.1% or 0.2% to get us closer to our goal of always on availability. Here we discuss our journey to achieve that magical 99.9% uptime figure for our Endurance-S solution, served off the AWS infrastructure. Amongst the many components of a collaboration infrastructure, here we discuss our attempt to move the storage infrastructure up a few notches and instead of using a disk as a disk with basic RAI. Compression to optimize storage and also achieve higher performance. Higher I/O performance to enable better response to end users. In our production environment for the collaboration infrastructure, we need to handle millions of small files distributed over thousands of folder (maildir). Our current infrastructure runs of an ext4 file system and we had to make a choice of whether we can get all of the above requirements met with EXT4 or would we need another file system. With this post, we have shared our observation of performance benchmarks done between Linux+EXT4 on EBS and Linux + ZFS over EBS. 3×250 GB General Purpose SSD (AWS specific) to test on. The zfs pool is configured in MIRROR mode of 2×250 GB Disks (Amazon-specific SSD). L2ARC of 40 GB has been added to the zfs pool for improving read speed. ZFS has been limited to use the system RAM maximum of 8 GB and minimum of 4 GB (in 16 GB system). Checksum has been turned off as faster performance is noticed with it. 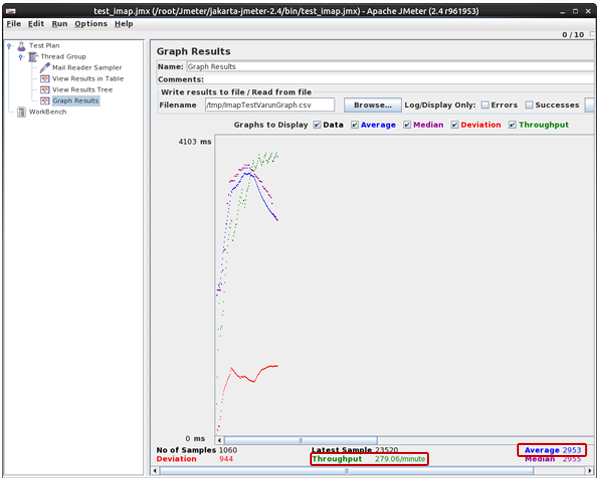 ZFS Compression is set to LZJB compression as it is faster than its counterparts. We made use of a pre-configured Mithi Connect Xf collaboration server on CentOS 6.0 to stress test POP and IMAP Protocols for different users. Specify the protocol to be used (IMAP/POP). We will be testing IMAP as of now. Insert Required details as marked in the below screenshots. Number of messages to retrieve (per thread/user) is set to 10. *For very aggressive testing, one can set it to All. However, it is not recommended for large mailboxes as the server will tend to hang up. For each thread, 10 messages will be retrieved, simultaneously. In the above screenshot, we can see the throughput = 279.06/minutes. This means that the server can handle ~279 requests per minute for retrieval. Average time is the time taken for 1 request to fulfill. The output is shown in CSV format. The field of concern is elapsed and bytes. Here, elapsed time is the time in milliseconds, to fetch 101091 bytes of data from server. P.S. : For EXT4 no changes had been done as far as optimization and tunings are concerned. EXT4 disk get strained on tests done for threads/user counts above 40. ZFS can handle more than 40 threads/user counts up to 60 without significant strain on imapd and/or server. No 2 tests had been run for a single user. Each test has been conducted for a different user (large mailbox only). ZFS looks promising on delivering data during peak hour usage without hampering other processes. On the other hand, tests on ext4 brought down idle time to ~50%. Using JMeter to test POP protocol is similar to that of IMAP. In this the only change is to be done of protocol name to pop3 and port number to 110. Same test environment were kept for pop3 testing too. *For POP protocol testing, we tested for both Checksum kept ON and OFF. Average time to complete 1 request is less when the checksum is set to OFF. Between ZFS (Checksum OFF) and EXT4, slightly higher performance gain can be seen in ZFS. 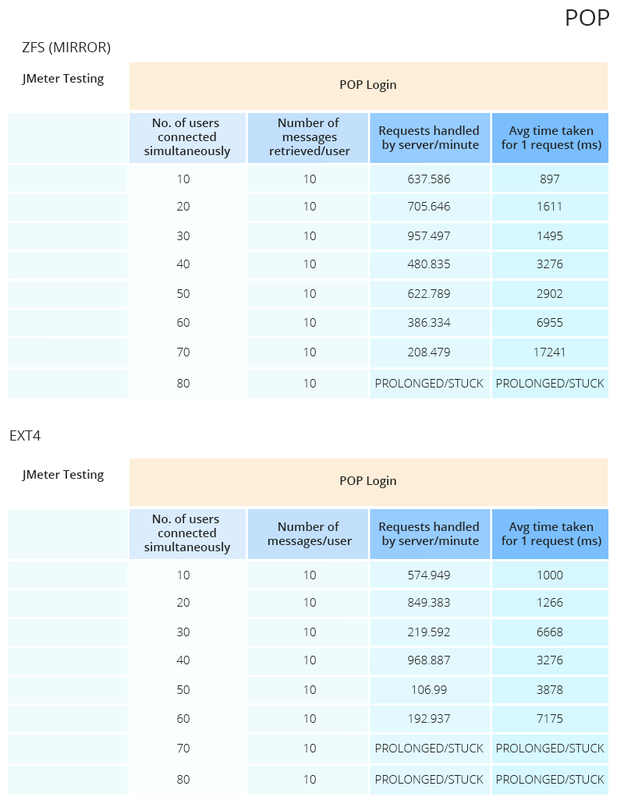 However, the average response time for 1 request is almost same in both the filesystem. Since both filesystems have the same average response time for 1 request, capacity to handle requests is better on ZFS, which means ZFS can handle loads better than ext4.